Patterson is nine years old and his brother, Keaton, is six years old. 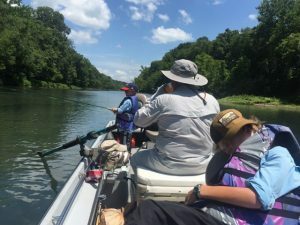 Their Dad, Jordan, wanted to introduce both of his sons to fly fishing and decided to make a trip to the Little Red River. We started the day at The Ozark Angler fly shop and had a little introductory fly fishing class before heading out to the river. We showed the brothers some of the bugs on the river that provide the primary food sources for our trout. We then showed them some of the flys we tie to imitate the natural bugs found in the river. About mid morning we loaded up and made a short drive to the river and launched the boat. 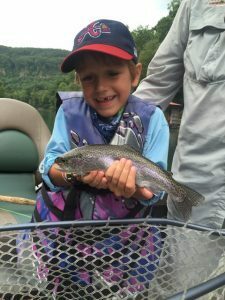 We worked on the roll cast for a while and both boys were quickly making nice short casts and mending their fly lines to achieve a drag free drift. 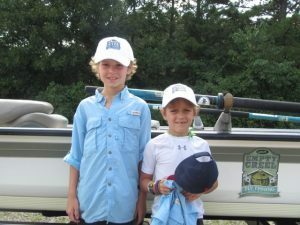 It was not long before both brothers were hooked up to their first trout on a fly. It took a few lost fish before each angler actually got a fish into the net. 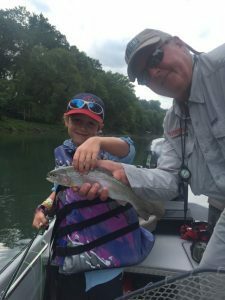 It was a very hot day and the fishing was a little slow but Patterson and Keaton worked really hard and we got some cool photos of their first fly fishing trip. Both boys rowed the boat for a while and we skipped a few rocks at lunch while looking for sowbug in the river. All in all it was a really fun day with two wonderful your men!